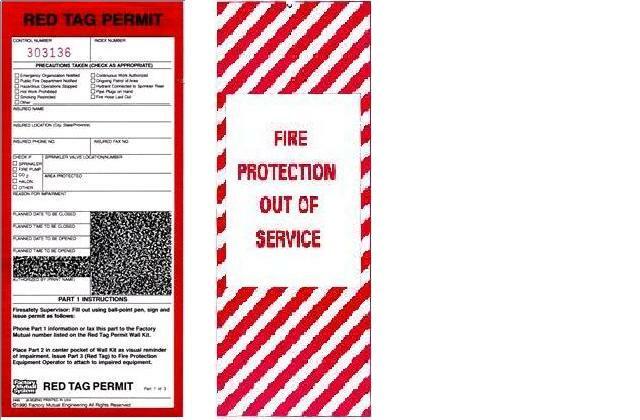 Whenever a Sprinkler Contractor is performing any work in a Tufts building that involves the impairment of an existing operational automatic fire sprinkler system, a permit shall be obtained from the local fire department. The Tufts Fire Marshal (617-627-3922) shall be notified of this impairment. In addition, the FM Global Red Tag shall be affixed to the system (see below) and FM Global shall be notified at the time of the impairment 888-606-4570. When the system has been restored the contractor shall call FM Global to confirm the restoration of the system.